Toxic Metals Contaminate Some Aurvedic Treatments : Shots - Health News The treatments are popular in India and the United States, but some can be contaminated with high levels of lead and other toxic metals. People continue to be harmed. 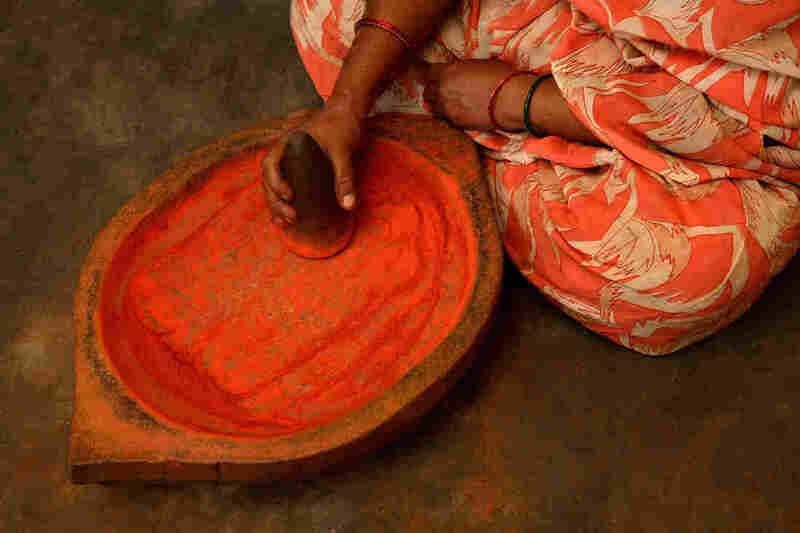 A woman prepares bhasma ingredients for an Ayurvedic treatment in India. Ayurveda is also used in the United States. Nisha Saini has been practicing an Indian traditional health form called Ayurveda for more than 16 years. She runs a small alternative health center in Manhattan called New York Ayurveda, where customers can get massages and dietary advice. Over the counter, Saini sells an extensive array of traditional remedies concocted from herbs and spices. But there's one kind of Ayurvedic medicine she doesn't sell. "[They're] mostly made from metal ashes. Those are called rasa products," Saini says. These medicines, also known as bhasmas, come out of an Ayurvedic tradition practiced for thousands of years in India where highly toxic heavy metals like lead, arsenic, mercury and cadmium mix with herbs or spices. Saini says she won't sell them because her American customers have questioned the safety of those concoctions. They aren't alone in their concerns. The New York health department issued an alert last week warning New Yorkers to stay away from some 20 Ayurvedic compounds after lab testing revealed dangerous levels of heavy metals there. Lead and mercury damage the nervous system and can cause permanent brain damage and death. Arsenic can cause cancer and death in high doses. Sometimes those warnings come too late. In 2010, a retired lawyer in Iowa brought bhasma medicines home from India. Six weeks after he began taking the medicine, he started struggling to remember simple things. Over the next eight months, he lost almost 40 pounds. He became weak, tired, anemic and depressed. "It was only several months later that his wife alerted his providers that he was taking Ayurvedic medication, and that there was a possibility lead was being ingested," says Dr. Laura Breeher, an occupational medicine physician at the Mayo Clinic in Rochester, Minn., who was part of the team that treated the man in 2011. When physicians tested his blood lead levels, the results were nine times over the threshold considered acceptable for adults. That medicine turned out to have hundreds of thousands of times the Food and Drug Administration's recommended limit for lead and arsenic in candy or water. Concerned that others were using the same or similar medicines, his doctors and the local health department reached out to Ayurvedic practitioners and centers in Iowa asking people to get themselves and their medications tested for heavy metals. "The concentrations varied. The medication with the highest concentration of lead had 43,200 parts per million. The FDA has a recommended maximum level of 0.1 parts per million for candy," Breeher says. In a paper published online last month in the International Journal of Occupational and Environmental Health, Breeher and her team report that 40 percent of the 115 people tested who were using Ayurveda had lead poisoning. This is the largest recorded cluster of lead poisoning from Ayurveda in the United States to date, but health providers and researchers have been struggling with heavy metals poisoning from alternative medicinal or herbal supplements for at least a decade. From 2000 to 2003, the Centers for Disease Control and Prevention reported cases of extreme lead poisoning in New Hampshire, California, Massachusetts, Texas and New York. In 2004 and 2008, researchers found about 20 percent of Ayurvedic products sold in the Boston area and on the Internet had dangerous levels of lead, mercury or arsenic. A group of pregnant women got severe lead poisoning from taking Ayurvedic medicines in 2011 and 2012 in New York City, and two small children there got lead poisoning in 2012. For some products, heavy metals might have leached into purely herbal formulas from the environment where the plants were grown or the manufacturing equipment used to make the medicine. But concoctions with extreme concentrations most likely had metals intentionally added as part of practice called rasa shastra. Ayurvedic practitioners say that heavy metals can increase the potency of an Ayurvedic mixture. "If they're used properly and in the right ratio, they're very effective properties," says Saini of New York Ayurveda. That's a hazardous view, says Dr. Robert Saper, director of integrative medicine at Boston Medical Center, who led both 2004 and 2008 studies on safety of Ayurvedic medicines. "There's such a wealth of evidence in the West that these metals have a variety of toxic effects," Saper says. "Until they can prove beyond a shadow of doubt the lack of toxicity, these metal bhasma compounds that contain lead, mercury or arsenic should be immediately stopped." But Ayurvedic advocates say they have the evidence. One argument is that if these medicines were truly so damaging, then why haven't people in India gotten ill from taking them? "People have done it for thousands of years, and people have benefited from them," Saini says. "In India, [bhasma] will go in hundreds of thousands of people. But I've heard no such problem." These bhasmas are put through a complicated process sometimes involving goat's urine or other acidic liquids that are said to detoxify heavy metals. In an email, Ayurveda scientist Kalpana Joshi at the University of Pune in India says Western scientists might have a lack of understanding about this process. "I do understand the skepticism of Western doctors. I believe adverse effects [experienced by patients] are due to not following right Ayurvedic methods and faulty shortcuts for large scale productions," she writes. In recent years, scientists like Joshi have been trying to use Western scientific method approaches to validate Ayurvedic claims. "Rasa sindur is a mercury preparation, and papers have proved it to be safe, nontoxic and improving life-span in fly models," Joshi writes. But Saper and his colleague Dr. Thuppil Venkatesh, a professor emeritus at St. John's Medical College in Bangalore, say those studies are flawed and these preparations do not convert heavy metals into new, nontoxic compounds. "They don't understand, and they continue to use toxic heavy metals in some of these preparations," says Venkatesh. In his own practice, he says he sees people suffering from heavy metal toxicity because of Ayurvedic bhasma medicines almost every day. "Children have died. People have lost their lives," he says. Others have suffered permanent brain damage. "It must be stopped." So far, stabs at effective policies in India and the United States to stop the production or distribution of contaminated Ayurvedics have fallen flat, according to Nancy Clark, the assistant commissioner for the New York Bureau of Environmental Hazards and Health. For years, health departments like hers have routinely issued cease-and-desist orders to shops from selling specific Ayurvedic or other traditional remedies, but only once a laboratory test confirms the product is dangerous. "And believe me, we also notify the Indian government," Clark says. "There are attempts on the Indian side to regulate products. Obviously, it's not working." The FDA has an embargo against certain Ayurvedic companies and specific products. "But they're not regulated," Clark says. "In this country Ayurvedics are considered supplements. There aren't any federal requirements for effectiveness or safety." And that doesn't stop people from carrying the preparations home from India in suitcases. Large U.S.-based retailers of Ayurvedic remedies like the Chopra Center generally will not sell supplements containing bhasmas. Chopra Center representative Felicia Rangel writes in an email that all their products are "triple tested for common metal contaminants" to meet California recommendations. But Clark says bhasmas can still be found in small stores where people personally imported or formulated them. Still other Ayurvedic medicines containing high amounts of heavy metals could simply be going unnoticed by customs and health departments. It's difficult to say how many people in the world use Ayurveda. On the Indian subcontinent, estimates range from 10 percent to 80 percent of the population, and there are large global communities centered on the discipline. Saper fears a large percentage of those people are at risk for heavy metals toxicity, but he doesn't want people to cease the practice altogether. There's much more to Ayurveda than bhasmas of metals and ashes, Saini says; it's a whole system of medicine. She says it's better thought of as a lifestyle that combines yoga, exercise, sleep routines, purely herbal supplements and nutrition. "Every Indian kitchen is like an Ayurvedic pharmacy. We have pepper, ginger, turmeric," says Venkatesh. "It's a great medicine, but one has to be very cautious." Saper says that approach focusing on exercise and good diet could be very beneficial, but the use of heavy metals in medicine is injuring people. "If this problem is not addressed, it really destroys the reputation of the system as a whole, and that's unfortunate."